These posts are part of a broad programme to improve career pathways for researchers in medicine and dentistry, set up in response to recommendations in the Walport Report, arising from a joint working party of the UK Clinical Research Collaboration and the NHS Modernising Medical Careers initiative. The Academic Foundation Programme allows 5% of trainee doctors to combine clinical training with research methods training. The start date is in August each year. Each academic programme includes a solely clinical F1 year. The second year F2 rotation includes two clinical specialties and one academic placement with hands-on research (each rotation lasts for four months). Primary care and Population Studies - particularly in the topic areas of infection, respiratory disease, mental health, alternative medicines, liver disease, and renal disease. All academic placements will be based in Southampton, with the exception of Functional Electrical Stimulation (FES), which is based in Salisbury. Find out more about research in the Faculty of Medicine here. Successful completion of an academic placement in the F2 year is likely to improve the prospects for trainees to compete for clinical academic fellowships in their subsequent registrar rotations and embark on a clinical academic career. Please see the Deanery website for details of application procedures. Further information can also be found on our Inspire site. 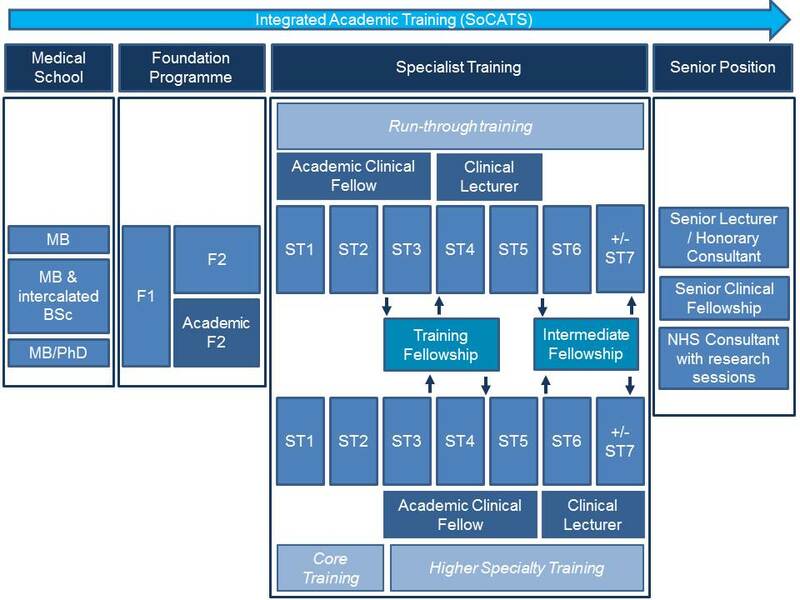 Academic Clinical Fellowship Posts are designed to provide support for doctors and dentists (including GPs and GDPs) entering specialist training who have outstanding potential for development as a researcher and/or educationalist, and enable them to work towards a higher degree. The scheme is open to F2 trainees and Senior House Officers who are eligible to apply for a National Training Number (NTN). Existing Specialist Registrars who already hold an NTN, and GPRs enrolled on vocational training schemes, are not eligible. The Clinical Academic Fellowships provide part-funding for the basic salary (25%) and consequently will allow the clinician in training to set aside time to develop academic skills and to prepare and compete for a training fellowship to undertake a higher degree. Funding for each specialist Clinical Academic Fellowship is available for a maximum of three years, and a maximum of four years for GPRs to allow completion of clinical training. Applications and appointments are administered by local appointment committees for the individual specialties, and the deadlines for receipt of applications are determined locally. Check the Deanery website for details of specialties being recruited to and application procedures. Details of the Academic Lead for each of these specialties can be found here. NIHR Clinical Lecturer posts are designed for specialist trainees, and newly qualified GPs, with a higher degree, for example a PhD or MD, to complete their academic and clinical training. Further information on NIHR Clinical Lectureships can be found here. Applications and appointments are administered by local appointment committees for the individual specialties, and the deadlines for receipt of applications are determined locally. Check the University of Southampton website for details of posts currently open to applicants. The Clinical Lecturer posts due to be appointed at the University between 1 April 2018 and 31 March 2019 can be found here.